Going meatless certainly has its advantages: On average, vegetarians of consume less saturated fat, salt, protein and overall fewer calories than those who eat meat, and according to the American Heart Association, the plant-based diet is generally healthier, regardless of age. Vegetarians not only pile more fiber and fresh vegetables on their plates, but also have a lower incidence of diabetes, obesity, heart disease and high blood pressure—conditions that often plague older people. There are, however, a few stumbling blocks to the perfect plant-based plan—especially for seniors. Read on for four tips to keep in mind if you're ready to go veggie. Many seniors experience difficulty chewing and swallowing food, especially fresh vegetables. Seniors should cook vegetables to soften them and use juicers to make fresh fruit easier to eat. Cutting food into smaller pieces and allowing more time to finish meals also can be help. When dentures present a problem, they should be repaired or discarded in favor of better-fitting teeth. According to the Vegetarian Resource Group, drinking sufficient amounts of water, about eight 8-ounce glasses each day, can also help relieve swallowing difficulties. A common complaint of seniors living alone is that they don't have the time or motivation to cook healthy meals. Caregivers and family members can help seniors maintain a healthy vegetarian diet with a few modifications and a pantry full of ready-to-eat foods. Many dishes such as vegetable soup, veggie chili and pasta dishes can be prepared in bulk and frozen in individual servings. Staples that can provide healthy meals and snacks include whole grain cereal, canned soup, dried and canned fruit and canned beans. 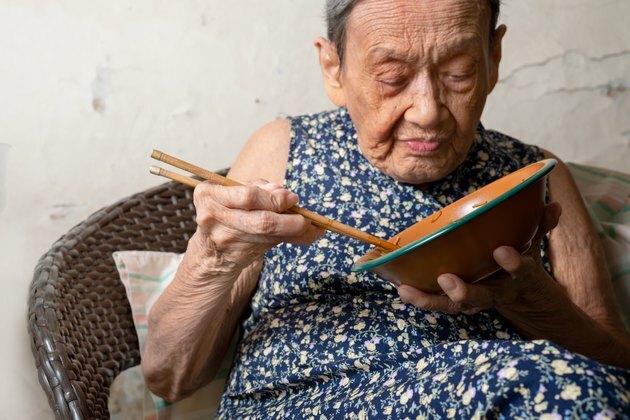 Because vegetarian diets don't include protein from meat products, seniors must get enough from other sources to maintain their energy levels. In addition to protein gleaned from vegetable sources, other foods that are high in protein content include nuts, seeds, legumes and whole grains, according to the American Heart Association, Soy is one of the richest sources of protein and available in a variety of prepared and packed foods. Daily calorie requirements decline with age, according to the American Dietetic Association. But while seniors may require fewer calories, they usually require increased amounts of some nutrients, such as calcium, vitamin D, protein and vitamin B12. Seniors must be careful about filling up on empty calories that will add excess weight and affect cholesterol levels as well. Sweets and foods high in saturated fats should be limited on a vegetarian diet. Seniors, just like younger vegetarians, must maintain a well-balanced diet with a variety of foods.